A friend of mine let me know about a recent find at Walmart’s meat counter recently, but I haven’t had a chance to find it for myself, until today! My find was individually vacuum packaged, frozen steaks. Options were New York strip or Ribeye! You might ask, Why is this such a good find? Well being a misplaced ranch kid in college that grew up having good cuts of beef and pork from the freezer several times a week, I have been missing out on the convenience. These individually frozen steaks are a big step for beef competing with the other meats (poultry, turkey, and pork) that have found success in preparing convenient meals, especially in individual portion sizes. These steaks will make it much more appealing to consumers who prepare individual meals and like to keep meats on hand longer than shelf life in a fridge. They really were not bad priced, 6 for $8.98. I haven’t tried them yet, but soon as I do, I will let you know how they fair. If I had my choice I would much rather have a deep freezer full of beef cuts, but this will definitely suffice until I can have that convenience again. Previous Mike Rowe Works- What is in America’s Future? What a great find. I know I am going to be looking in my Wal-mart tonight when I go grocery shopping. I love beef, and try to eat it as much as possible. Looking forward to hearing what you think of the taste! We have had those locally now for a few years. And I noticed the other day they had several different brands now. From experience some are really good, some not so much. It is very handy having each steak individually packed. 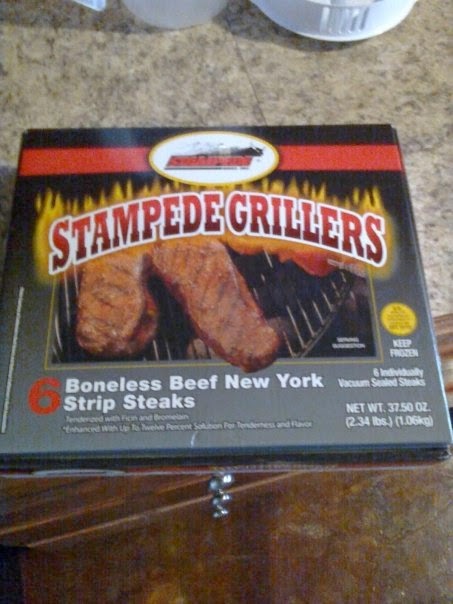 Almost bought some, but it isn't quite grilling weather yet….